I made this salad for dinner recently with truffle grilled cheese sandwiches and it was a big hit with all of us. My toddler was frantic when she spotted her salad-filled bowl (though she is often frantic with anticipation in the moments leading up to dinner) and had cleaned the entire thing before I could even let her sandwich cool a bit and cut it into quarters. 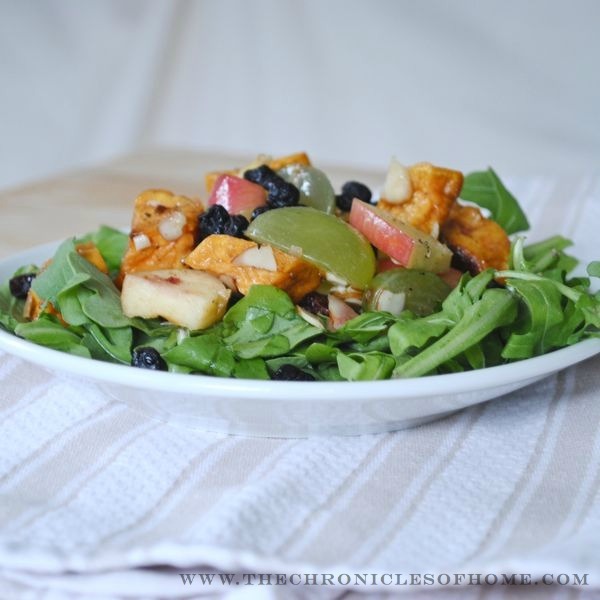 This salad hits all the right flavor and texture notes for an interesting and satisfying salad. 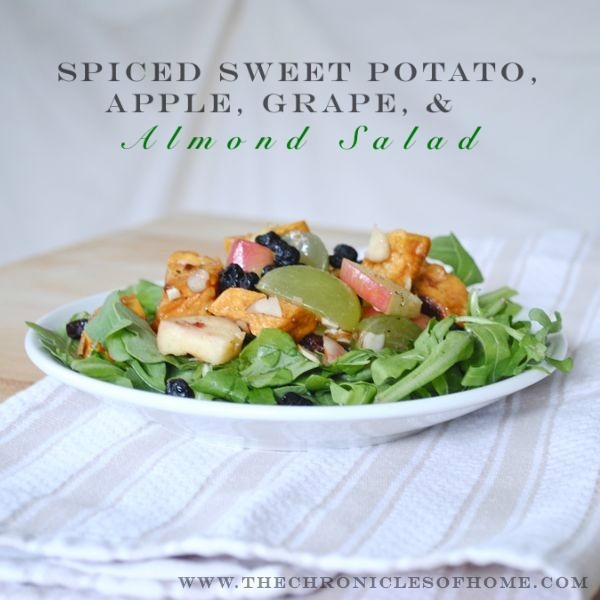 The roasted sweet potatoes add a creamy richness, the apples and grapes are crisp and juicy, the nuts add just the right bit of crunch, and the dried fruit brings a pleasantly chewy and tart layer to the mix. It would be a great Thanksgiving starter – not too heavy, light and fresh, but the sweet potatoes and apples make it taste and feel like a distinctly fall salad. If you’re looking for a great salad for your feast, give this a test run this week. Or just make it for yourself as a quick and healthy dinner as you prepare for the holiday next week! A couple notes on the ingredients: I used green grapes but red would work equally well. Dried cranberries or dried blueberries would both be great as the dried fruit. My favorite dried blueberries are Trader Joe’s dried wild blueberries – they have a really great chewy texture and I think they’re just a bit milder than other dried blueberries out there. You can also substitute butternut squash for the sweet potatoes but cut the roasting time in half. Toss sweet potatoes, 1 tbsp. olive oil, sesame oil, cumin, and 1/2 tsp. salt in a medium bowl. Spread on a baking sheet in a single layer and roast until tender and starting to brown, about an hour. Let cool slightly. Meanwhile, combine the apple cider, vinegar, and shallots in a small saucepan and bring to a boil over medium-high heat. Cook until the mixture is reduced to about 1/4 cup, 6-8 minutes. Take off the heat and whisk in 1/2 c. olive oil, 1 tsp salt, and 1/2 tsp. pepper. Place arugula in a large bowl and toss with some of the dressing. 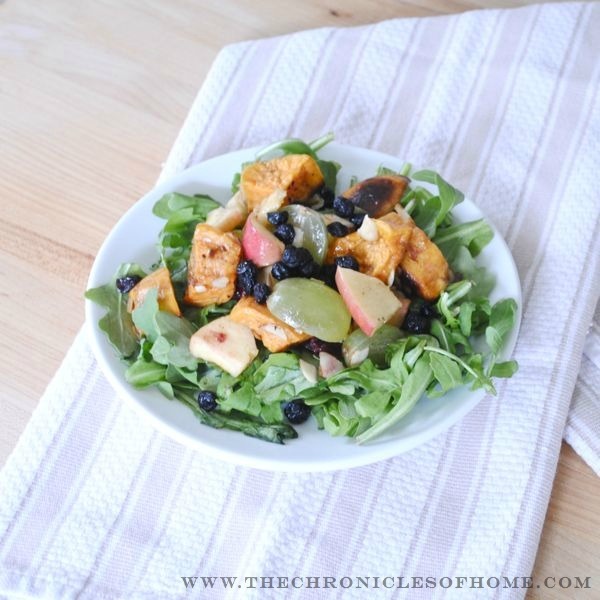 Divide the arugula among four plates and top with apples, grapes, dried blueberries, almonds, and sweet potatoes. Drizzle more dressing over the top and serve. Recipe adapted from “Roasted Yam and Apple Salad” in Bon Appetit’s October 2008 issue.